Hello you guys! It has been a very long time. I will be providing you with long overdue updates on what's been happening recently. First, food! November 29th 2014 was my first date with my boyfriend. We organised it beforehand, the cliche dinner and then cinema. He booked reservations (brownie points!) for 6:30pm which we luckily made as he was late, to be fair it wasn't his fault. Also, we didn't know where the place was so he had to whip out his google maps and it took a good few minutes for us to realise we were going the wrong way. I wasn't aware of where he was taking me as it was a surprise but I did know it was Korean restaurant. 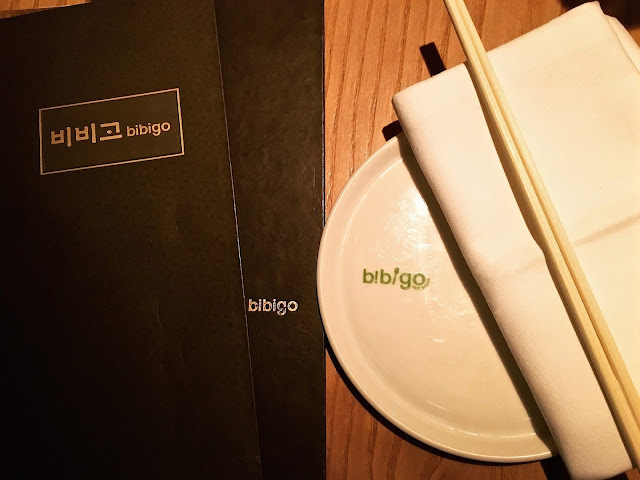 After 10 minutes of trying to find the place, we were finally seated at Bibigo. This year, we decided to re-enact the whole thing - go for dinner then the cinema. A little cheesy but cute. Originally the idea was suggested as a joke, but the more we discussed it the more we actually wanted to go ahead with it. We were really early this year, the reservation was 7pm and we arrived half an hour early, they were actually fine with it and immediately seated us. Not feeling the alcohol, we both opted for an orange juice and coke. Finally, onto the food... In an attempt to be sensible with our food, we decided to order some starters before deciding what we were going to have for our mains. Before I met Eric, I didn't know anything about Korean food and hadn't tried it, so I trusted him to order for both of us. Now, I knew exactly what it was that I wanted. 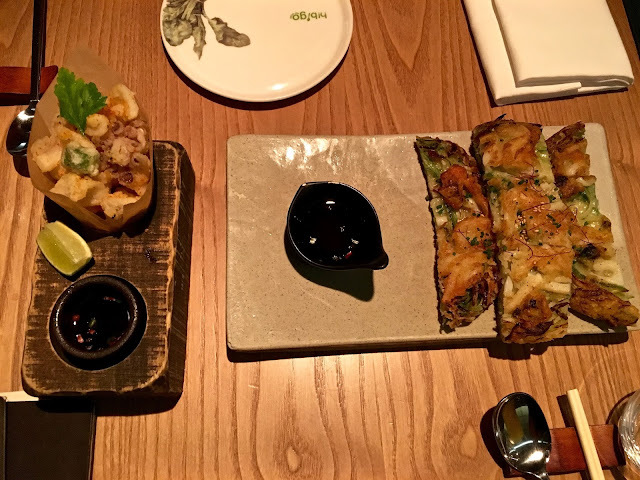 Our starters consisted of calamari (deep-fried baby squid) and the 'pajeon' seafood pancake, both of which came with citrus soy sauce. Whenever we go to any Korean restaurant, I always make sure that we order these. It's absolutely delicious! The squid had the right amount of crispiness to it. Whereas, the seafood pancake was full of moisture and you could taste every single ingredient (e.g. leek, mussels and squid), it was divine! The mains was already pre-established, for sure we were going to order Bulgogi. 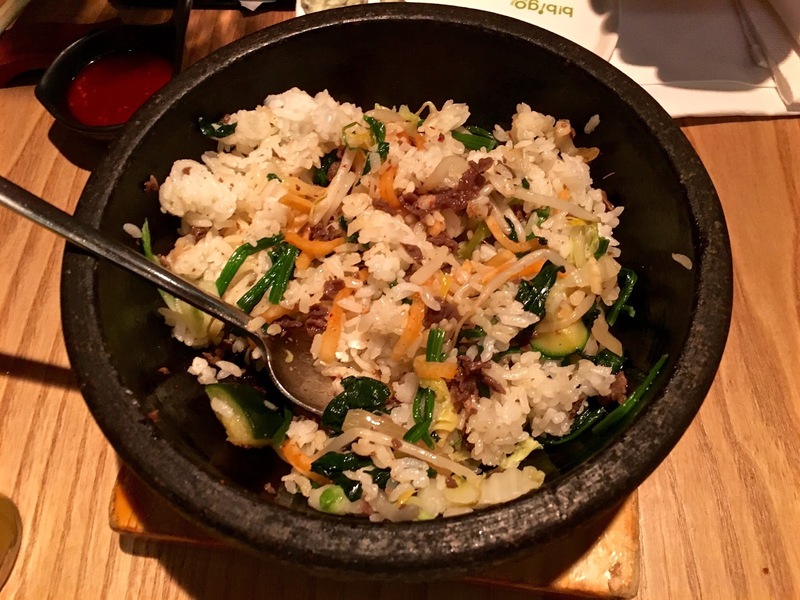 But alongside that (and apologetically forgetting to take a picture before we mixed it up) was the hot stone bibimbap. It was a mixture of vegetables with rice, which was a great combination as the vegetables added that extra flavour to it. There was also hints of beef mince thrown into the mix. There was the option of adding kohot sauce, but I don't like spicy food so we left that out. I found that it was very hard to eat with chopsticks so I had to alternate between my chopsticks and a spoon. 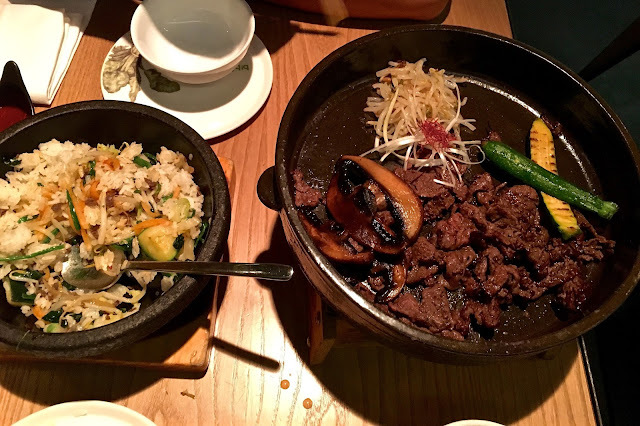 Onto the main reason why we love Korean food so much, the traditional bulgogi. The beef had such a rich, succulent taste to it. You could really taste the barbecue and it was cooked to perfection, some of the sides on the beef were slightly overdone but that just added a hint of crispiness to it. I didn't taste any of the mushrooms (again, not a fan) but the courgette and bean sprouts was a refreshing touch. Additionally to our bulgogi and bibimbap, Eric ordered the red chicken. It was spicy, so this was all for him. This however, presented a brilliant opportunity for me to hog the bulgogi! 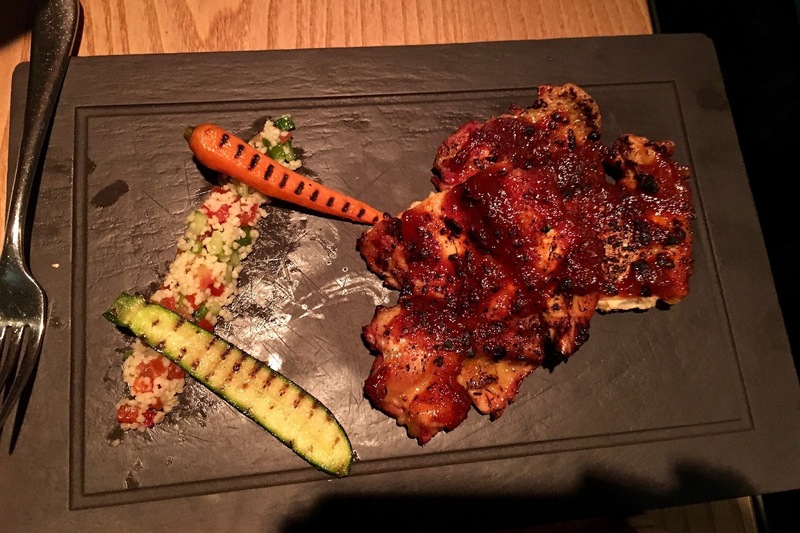 "It had a tender and eloquent taste to it despite the spiciness." As I have such a bad sweet tooth, I had to order dessert. I made sure I left enough room for it! After recovering from the mains, Eric decided to order the eton mess whilst I opted for the Fig Creme Brûlée. The vanilla creme brûlée was average, not the best I've ever had but I loved the creamy and soft consistency. I'm not too sure about the raspberry sorbet combination, I just had the raspberry sorbet ice cream on its own and then moved onto the creme brûlée. I didn't like it together. Furthermore, I found that the caramel layer on top wasn't sweet enough but the custard made up for it. The Eton Mess on the other hand was the complete opposite, it was sweet and very rich in flavour. "it was nice and crunchy yet delicate"
Overall, Bibigo has been the second best Korean restaurant we've ever been to. In terms of its customer service, they're quick to serve you and very welcoming. 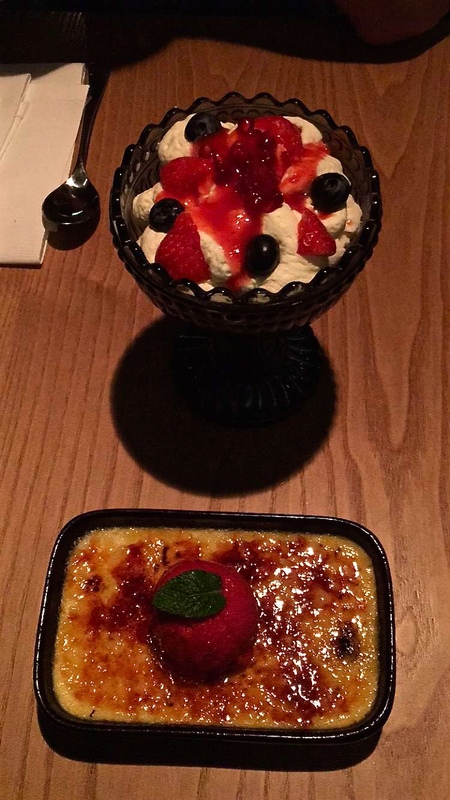 The food was cooked brilliantly and served at a reasonable amount of time, the only let down for me was the dessert. It's such an ideal place for a date for two or even to go with your friends. I would advise that you book in advance, it does get very busy. Especially, past eight in the evening. The price, I would allow at least £30-£40 per head? it depends on what you order really but this was enough to make us both very full. I do highly recommend it, it's fairly affordable and the food is worth way more than it costs. After, we proceeded to the same cinema we went to last year. Funnily enough, last year we viewed The Hunger Games: Mockingjay part 1, and this year it was released in time for us to see part 2 at the exact same day. The film was average, I personally prefer the books.